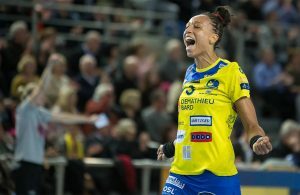 Home / News / EHF / It’s a rematch: Vardar are in the final! On the second semifinal of the day, HC Vardar defeated Rostov Don 19-25, in a match that did not have many equivalents. With an astounding performance from Amandine Leynaud (finished with 50% of saves) and a good defense, the Macedonian team made it to the final for the second year in a row and will now try to lift the title for the first time ever after having qualified for the tournament in all editions. It was the match of the contrasts. The debutants from Rostov Don against the experienced HC Vardar. Debutants, in a way. Because it might have been the club’s first time in an EHF Final 4, but the coached by Frederic Bougeant is a squad with Olympic, European and World champions. But none of that mattered this afternoon as the girls from HC Vardar showed, once again, why they’ve reached this stage. The match started off better for the Macedonian team, who were finding the net and were counting with the unsurpassable Leynaud, who at one point had stopped 9 out of 13 shots (that’s 69%, yes). Vardar were hurting the Russians mainly through their 9-meter shots, but they also did good in the comeback, cutting one of Rostov’s most deadly weapons, their fast breaks. After a first half that finished 7-10, the match continued to be tight, but dominated by last year’s silver medalists. The difference was not bigger than 3 or 4 goals, but it was very difficult for Rostov to catch up. 15’ into the second half, Brazilian centre back Ana Paula Rodrigues suffered an injury on her right ankle and was taken out of the court on a stretcher. Her replacement, Ekaterina Ilina had some outstanding minutes that helped Rostov stay in the game, but given the time left on the clock, it was too late for an epic comeback and Vardar took the victory by 19-25. One of Vardar’s top scorers, Andrea Penezic (7 goals, just like Andrea Lekic) explained the reasons for the team’s success: “I think we started very well. This was our main goal, to open the game very good on the first 15 minutes, being strong in defense. I think that we achieved that, we stopped their fast breaks, which I think is their main weapon, and we deserved this victory today. We had the lead for two or three goals the whole game, the whole game was in our hands. Maybe in some moments we played a little bit slowly, but we are saving the strength for tomorrow also”. Tomorrow’s final will be a rematch from last year’s final and Penezic is well aware that it will be a tough one. “It will be hard against Győr tomorrow, but if you want to win sometimes you have to have luck and all the players have to be on a high level. Last year, unfortunately we lost by one goal, I think last year it was just a matter of luck. We didn’t really prepare for the final game, we were focused just on Rostov, but I know our coach has prepared everything. Tomorrow will be emotional for us, but this is life, this is sport, we are professionals, we will give it all, we will leave our hearts on the court and the better team will win”. A visibly excited Dragana Cvijic, who already knows what is like to be an EHF Final 4 winner, felt confident about Vardar’s chances ahead of the final against the Hungarian powerhouse. “I am very happy, we won by six goals against a very good team, our defense was very good we stopped their fast breaks and this is very important; we prepared for this game for three weeks and we came here very well prepared. I’m really happy because we fought for each other and this is the most important. Tomorrow we must play much better than today, we must show them from the warm up that we want this trophy, like today. We must not give them any chance against us, that’s the only way we can succeed tomorrow, because if we just come to play the final we will lose for sure because Győr is a very, very good team, their constant, they have very good matches on the Hungarian league, that means that tomorrow it will be a very good final. It is quite present for everyone in Vardar the fact that the team as we know it will no longer exist, so that sense of nostalgia and eagerness to finish the era with a trophy is definitely one of their motivations. It is not any different for Cvijic, who’s only been in the team for one season, but who feels at ease with the group: “I lost many times against Győr and I have to prove tomorrow that I can win against them, and I’m sure that if we play like today we will take the trophy. We came here because of this trophy, we will no longer exist next season and this is painful; some said that this is something that could put us away from the court, but we are here for us and we will kill for each other, that’s the most important thing”. The final EHF Final 4 decisive match will be today at 18hs and HC Vardar will try to steal the trophy from the title holders, Győri Audi ETO KC.